The Maxxis LYNX M937 Front and M938 Rear quad tyres are 23" diameter original equipment fitment tyres to several Yamaha ATV's. 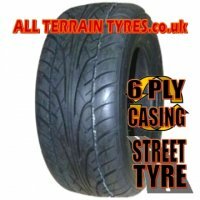 They are 'E' marked road legal knobbly tyres, and will fit any quad bike with 12" rims needing lower profile tyres than the more common 25" diameter standard fitments. The radial tyre construction also offers greatly improved handling with a smoother, softer ride.